New Zealand's Michael Hendry remains in contention at the midway point of the $A1 million Australian Masters in Melbourne today after another impressive round enabled him to hold outright second behind leader Matt Guyatt. For a second successive round the 32-year-old Aucklander held Australian world No.5 Adam Scott and English defending champion Ian Poulter at bay by fashioning superior rounds at the Kingston Heath sandbelt layout. Hendry was unable to make inroads on Queenslander Guyatt's two-stroke lead but has already eclipsed his Masters debut on the course in 2009 where he failed to make the cut. There was never any prospect of taking this weekend off following his opening 5-under 67; he followed that up with a risk-free 3-under 69. Taking advantage of an early tee off - Hendry only had to contend with blustery winds on the final six holes - he started on the back nine and birdied the second before squandering that gain with a bogey on the next. 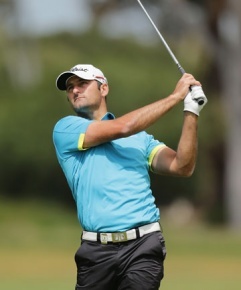 Hendry then added four birdies before a blemish on the last prevented the right hander from Gulf Harbour trimming overnight leader Guyatt's lead to one after he matched the Kiwi's 69 to be 10-under the card. Tournament favourite Scott looms just a stroke behind Hendry after a 2-under 70 while Poulter had to be content with an even-par round and share of fourth with Australian Craig Hancock. Hendry, the Australasian PGA Tour order of merit leader, was satisfied after constructing another consistent round. "I'm playing really well, I think mostly because I'm putting it well. I'm hitting my irons fairly well but I'm driving the ball pretty poorly so I need to get out there and work on that," he said before heading to the practice range. "The thing about Kingston Heath is you don't have to have a lot of drivers, you can button back and hit a lot of 3-woods to put yourself in position. That's what I've been doing effectively, the irons have been going close enough to the hole that I can make a few birdies." Although the string of sandbelt courses can be notoriously tough to tame, Hendry was relishing the challenge. "I really enjoy playing the type of golf that you have to play around here. It takes a lot of thought to get round and luckily I've been thinking pretty well and my caddy (Jordan Dasler) has been making some great decisions too. "We just seem to be working well as a team at the moment, so hopefully we can continue to do that over the weekend." All but five of the 15-strong Kiwi contingent made the cut with Kevin Smith the big improver as he cut nine shots off a bogey-strewn opening round to produce a sound 69 and beat the four-over cut off mark by a stroke. Unfortunately Jared Pender lurched in the opposite direction with an 80 representing a 10-shot deterioration on his first-up effort. Left hander Gareth Paddison was the next best Kiwi in a tie for ninth after signing for another 1-under 71, Mark Brown was a stroke adrift of his compatriot while Mahal Pearce was left to lament a 76 after an encouraging 69. Brad Shilton, Doug Holloway, Ryan Fox and Michael Long also tee off tomorrow; Pieter Zwart, Ben Campbell, Hamish Robertson and Sven Puynbroeck had to stow their clubs.